The synthesis between architects and custom builders can be like oil and water. With intersecting yet disparate goals, it's a wonder architect and builder get along at all, much less come up with a finished custom home at the end of the process. The synthesis between architects and custom builders is often akin to that of oil and water. In building a home, an architect hopes to achieve a certain aesthetic, a design that will be both functional and beautiful. A custom builder hopes for the same while applying good construction methods and keeping an eye on the budget. With these intersecting yet disparate goals, it's a wonder architect and builder get along at all, much less come up with a finished custom home at the end of the process. But it happens everyday, and not just by luck. When an architect and custom builder bring talent and experience to the table, keep the lines of communication open and are flexible team players, they can work together like a well-oiled machine. Custom builder and architect will have less conflict when they respect each other's talent, experience and professionalism. "Builders should be hiring architects for their design expertise, and they should really allow an architect to make their strong recommendations regarding the design and its execution," says Ray Hartshorne, partner with Hartshorne Plunkard Architecture in Chicago. "Likewise, the architect should recognize that the builder has great expertise on building and should recognize and pay attention to that strength." Problems can arise when architects act as the authority on cost and construction techniques or builders do the same regarding design. "It's when the builder crosses his bounds to some degree and starts to become the architect," says Dominick Tringali, president of Dominick Tringali Architects in Bloomfield Hills, Mich. "Certain builders feel like they have to do that rather than use their building experience for what they are supposed to, which is the budgeting, scheduling and making the vision come together. "That's a challenge," he adds, "because the homeowner is caught in the middle. They have a builder they trust, and they have an architect they trust: two different people, two different visions and two different directions." The problem gets worse when either architect or builder is not as experienced, professional or talented as one would hope. "There's nothing more respected in the field than an architect who has paid his dues, has done a lot of really good working drawings and the dimensions simply add up and make sense," says Brad O'Neill, president of the The O'Neill Group, a design/build firm in Blaine, Wash. "They may even have a clever way to do it. Builders really admire that." "On the other hand," O'Neill adds, "I've seen some architectural drawings and thought, 'What a nightmare!' The concept is so hard to get to. And it's expensive. So when you get there, it may not be worth it financially. "There are architects out there who are really talented, but they're not good," he explains. "They can sit down and design a French haute taute building that is to die for. You look at it and proportionately it's correct and it's got an enthusiastic approach. But the person is an artist and not an architect. Everybody sees and likes the drawings, but there is no detail as to how to construct it." Architects might also find themselves working with a substandard custom builder. "The architect historically has the right to judge whether the work is up to specification," says Bernie Baker of Bernie Baker Architects PS in Seattle. "So you get into situations occasionally where the work is substandard, and it's already installed or built. So you have to make the hard call and say, 'That is not acceptable.'" Both custom builder and architect may be clearly qualified and able to do the job but still encounter challenges in working together. "If it's going to be French Provencal, you would go to great lengths to make sure that those architectural details were authentic so that when the project was done, you had a masterpiece," O'Neill says. "That probably reflects the ego of any architect as they move forward on any project. I found that builders were so price sensitive, they sought what they considered to be 'clever' ways of doing the same thing for less money. Of course, there is no such thing." Because O'Neill serves as both builder and architect, he can estimate costs accurately. Others aren't so lucky. Some architects, he says, can be out of touch with what materials and labor cost, putting them at odds with both builder and home buyer. "The architect is usually the one that sets the budget," says O'Neill, "and that's usually a bad deal, because if architects are not involved in the day-to-day business of building, they lose track of costs. An architect will tell a client, 'I'm going to do this Tuscan project for you, and it will cost $3 million.' The client says, 'We've got this builder to die for,' and they bring him on. This builder comes forward and says, 'I'm sorry. It's $4 million to do what you want to do.' That's a hair-raising time. The client's asking, 'Well, who's right?' The builder says, 'I'm right.' And nine times out of 10, he is." Sometimes architects will outsource some of the design work and bill it to the client. Mechanical engineers, landscape architects, interior architects and kitchen designers quickly add to the price of home design. "These individuals are, quite honestly, doing some of the architect's job," says Rial Jones, president of Jones Clayton Construction in Orlando, Fla. "Truthfully, if you get all of these professionals involved, the end project is better. But the home-owner is paying X number of dollars per hour to design this when they thought they had already paid for that in the design of the drawings." On the flip side are builders who wreak havoc by altering the design during construction without consulting the architect or letting the customer know that he or she may be charged for it. "A subcontractor deems the work they are doing to be over and above what they are supposed to do," says Baker. "He or she bills the contractor, and it comes through to the owner as a change order. The architect or owner never approved that so-called 'extra work.'" Extra client charges aren't the only issue. "We had a second floor balcony on a show home that the builder decided to close in as sort of a second floor sunroom," says Edward Binkley, a partner at Bloodgood Sharp Buster, Southeast. "A neat change we would have totally agreed with, but we just didn't know about it." Binkley's crew found out when they showed up at the site at about the same time as the inspectors did. "There were things built that weren't on the drawings," Binkley says. "We were told to revise them quickly. It got very frantic. You've got the prospect of having your project shut down. That's never a good situation." "It's not that I can blame a lot of builders,' Binkley adds, "because typically the high-quality ones can make some very good decisions as they go. They just need to understand that they need to keep us in the picture as well." 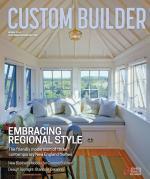 When a custom builder hires an architect to design a custom home, who owns the plans? Tom Wacome, president of Wynwood Associates, a custom builder in Andover, Mass., taught a class at NAHB's 2006 Custom Builder Symposium in October on this subject. "A builder in Colorado hired an architect for the working drawings," says Wacome. "The wife was very involved with the design. She truly came up with the house, and the architect made the plans. A few years later, they found a lot that they wanted to build a similar house. They modified just a wing or two and built it. A year later they got a call from that architect asking for something like $15,000 or $20,000, whatever he charged them the first time, saying he owned that plan." "The home builder paid for and conceptualized the plan," says Wacome. "The builder can't draw the plans, but he knows what he wants to build. Or he doesn't know but has this idea and the architect helps him form the plan. Builders take pride in designing their own homes. They feel that they own the plans. "But the architect owns the plan — even if he copied if from something the builder drew. If it is not clearly laid out otherwise in a work-for-hire agreement, the plans are considered the property of the architect. " Architects and custom builders agree that good communication is key to a successful working relationship. One way to facilitate that communication, builders and architects say, is with regularly scheduled meetings. Baker says his team holds project meetings with the owner and contractor about twice a month. "Everybody gets to have a voice," he says. "We offer the agenda, but we ask the owner and the contractor input on the agenda." Gathering the team — custom builder, architect, interior designer, landscape architect, and other key players — before the project even starts can help ensure everyone is on the same page and help avoid surprises. "I'm a big believer in the builder and the architect being on board at the same time and at the very beginning," says Jones, "so that reasonable budgets and expectations can be established. Selecting the right team can help avoid conflict and communication problems while keeping all players — and the homeowner — happy. Sometimes, that means tapping past business partners to save stress and a few extra steps. "Having a builder and architect who have worked together extensively in the past is a big advantage," Jones adds. "When we're preparing a fixed-price bid for a homeowner and we look at a particular architect that we haven't had experience with, we may not really know everything that's in those drawings. But if we know this is one of ABC Architect's drawings, we know how they design their structure. We know what kind of finishes they use. It's comforting for us if it's somebody that we've already worked with." "There is kind of an unspoken rule when we have a team member, an architect that we're used to working with," adds Jones. "We don't go running to the home buyer every time there's a mistake on the drawing, saying, "Oh my gosh, these plans are no good! Look at this crazy architect.' And if an architect comes out to the job and sees that we haven't executed something, he or she will deal with us about it as opposed to running to the homeowner. "I keep the homeowner out of a lot of that," Jones says. "If you develop a good team relationship with an architect, it really does make it a lot easier." When a homeowner chooses the builder and architects, having a meeting as soon as possible can pave the way to a good relationship — and foreshadow the months ahead. "You know it within the first hour of working with someone," says O'Neill. "This is going to be a dream; this guy knows what he's doing; he's done it a hundred times; we speak the same language. It's just sweet music. Or in an hour you know it's going to be a nightmare; they don't have a clue what I'm talking about, and yet they try to fake it because they want the job." Some builders and architects ignore their gut and follow through with such projects. "You just kind of grin and bear it," says Jones. "Unfortunately, you're in it for the long haul. You do what you have to do to get through it and come up with the best project at the end of the day, and hope everybody doesn't kill each other." But many contracts between architects, builders and the home buyer specify terms under which the arrangement can be broken and each party can walk away. "Probably 95 percent of our experiences have been very positive with builders," says Binkley. "Bottom line, if for any reason the arrangement isn't working out, we both have the right to dissolve the contract. We have come very close to doing that with only a couple of custom clients in 20 years of so of doing this. We really try to make sure personalities mesh at the beginning, whether it's the builder or the custom client. This is a very personal relationship. If you don't mesh, there really is no point in going through with it." An experienced professional — be it builder or architect — will likely want to be involved in a project from the beginning to offer solid opinions on the proposed house plan. "The people that we like to work with are people that are not 'yes' men or women," says Bernie Baker of Bernie Baker Architects PS in Seattle. "They are people who are somewhat passionately connected to the project. They really want to do it. They are really vested in the craft of what it takes to build a fine home." An architect should balance a strong opinion about the design with an openness to other perspectives, architects say. "It's incumbent on a good architect to argue their point and really stick to their guns in terms of the vision and the aesthetics of the concept of what they're trying to execute," says Ray Hartshorne of Hartshorne Plunkard Architecture in Chicago. "But if the architect has done that and they are still not getting anywhere, then the architect has to present options that they feel comfortable with. An architect is going to have to be a good listener and come up with an accommodating solution." The builder needs to be honest and flexible also. "If the builder just really doesn't like the aesthetics," says Hartshorne, "the best thing to do is present options or get photos or magazine clippings of things that they really feel strongly about, talk to the architect about it and see if they can strike an accord." Comments on: "Builder Versus Architect"